The city of San Juan has yet to finalize new municipal judge Jorge Zambrano’s pay more than a week after his hiring. The San Juan City Commission named Zambrano, a Pharr-San Juan-Alamo school board member, to the newly formed position during its regularly scheduled meeting on Jan. 8 — less than a month after the job opened. San Juan City Manager Ben Arjona said the city is still negotiating a contract with Zambrano, the sole applicant for the position. Though the city of San Juan has employed two municipal judges for about 10 years, commissioners felt another judge was needed to handle traffic and code enforcement citations, among other job duties. Weslaco, a city of about 3,000 more residents than San Juan, employs two part-time municipal judges. “ We’ve had so many different cases that one more can really, really help out the city,” said San Juan Commissioner Ernesto “Neto” Guajardo, following Zambrano’s swearing-in ceremony held Wednesday inside the commission chamber. The city manager said he could not disclose how much San Juan pays its two municipal judges, since the city remains negotiating Zambrano’s pay. The Monitor requested the municipal judges’ contracts from the city of San Juan under the Texas Public Information Act. Arjona, however, said even though the position was not included in this fiscal year’s budget, the city is able to afford an additional municipal judge. The commission discussed the city manager and municipal judge positions behind closed doors during executive session last week before hiring Zambrano. A visiting judge from neighboring Alamo would typically serve as municipal judge when San Juan’s two municipal judges were unavailable. Zambrano refused an interview following Wednesday’s ceremony and requested questions be sent by email. He did not respond to an email as of press time Thursday night. 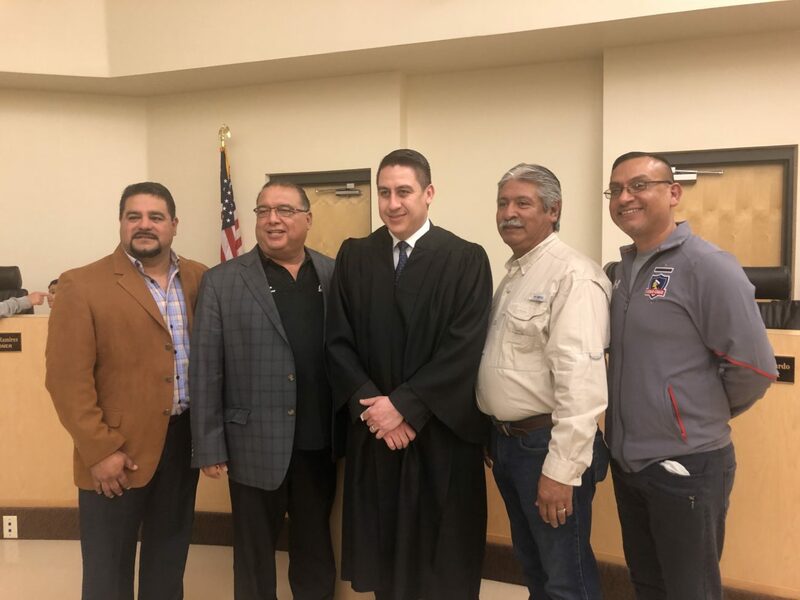 The city held a swearing-in ceremony for Zambrano in the commission’s chamber, where various school board members, including his brother, PSJA school board President Jessie Zambrano, and other elected officials were in attendance. In a short speech, Zambrano thanked those in the room, God and his family. Some of those in attendance then celebrated by cutting into a congratulatory cake. In addition to now serving as municipal judge, Zambrano works at his brother’s law office and as a real estate agent, he said.